7, 1 p. : col. ill. ; 17 cm. Pagination includes wrappers; text completed on lower wrapper. 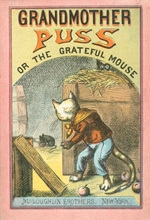 Chromolithographs: cover ill., text illustrations. son called Peter, who lives with her. and most tender mice, she could catch. I think she spoiled him, as other Grandmothers do. rolling gently toward his hole! she often saw him, she could never catch him. lugging off a whole cooky, to give to his lame sister. and he was very fond of apples, indeed. about to taste a fine, juicy one, when the cat saw him. mice before they can catch them. The Old Rat Stealing Cheese. that I am able to do." Death of the Old Rat. would punish him much, even if she found him out. She saw Peter, and wondered what he was about. mind. Quick as a flash, the wicked Peter grabbed him! much thought of in the very highest circles of society.